Casa Carino is een onderdeel van de luxe vakantiewoning complex genaamd "Dreamer Circle" in het Pacific Heights omgeving van Sayulita, de meest gewilde locatie in de stad. Ontworpen door de beroemdste architect Sayulita's, Miguel Valverde, die Casa Paloma, Casa Sonadora en Villa Colina gebouwd en ontworpen - allemaal naast Casa Carino. (Hij heeft ook ontwierp en bouwde een huis voor de president van Mexico!) Casa Carino is een echt speciaal luxe huis voor de veeleisende vakantieganger in de beste wijk Sayulita en het dichtst bij het strand en het plein. Een totale en complete renovatie is net afgerond. Het oorspronkelijke huis werd gestript en aanvullende verhalen worden toegevoegd. Gelieve viewVRBO Listing # 5885 of VRBO Listing # 440595 om de kwaliteit van de woningen die deze eigenaar en architect hebben opgebouwd te zien! 2 slaapkamer suites plus nog eens converteerbare TV / slaapkamer met aangrenzende badkamer. Er is 1 kingsize bed, 1 queen bed en converteerbare luxe kingsize slaapbank. Er zijn 2 buitendouches. Deze prachtige woning heeft een prachtig uitzicht op de oceaan, een verwarmd zwembad, tropische landschap en toch slechts twee blokken van het centrum van Sayulita en de belangrijkste strand. Het huis is omgeven door prachtige tuinen die ongekende schoonheid en sereniteit te bieden. Het uitzicht op de heuvels en het dorp zijn voortreffelijk. De woning is ingericht met een ongelooflijke kunst en meubels en elk detail van dit huis wordt grondig beschouwd als u een zeer aangename esthetische verlenen. 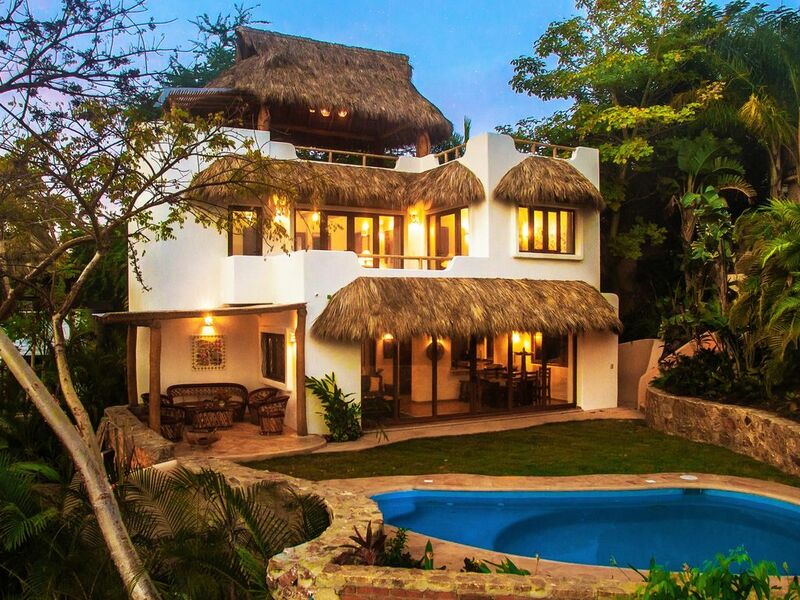 Casa Carino is de 4e Sayulita huis gecreëerd door de eigenaren en dit is hun favoriete - de plaats die ze blijven als ze naar Sayulita komen. Bij Casa Carino, kunt u genieten van de essentie van Sayulita, Mexico. De sfeer hier is dat van een klein, vriendelijk, vissersdorp in een exotische natuurlijke omgeving. De perfecte, rustige omgeving om te ontspannen en te genieten van Sayulita's unieke schoonheid. Kijk dan op de VLOER PLANNEN IN DE FOTO AFDELING. Great location. REALLY CAN walk to everything. We loved our stay. The only recommendations would be to update the infant high chair and pack n play. The location and house were great - the pool was great, most of the staff were prompt and helpful, and the location was ideally one block off town and beach. Unfortunately, we had a burst hot water pipe for our entire stay, so no hot water. Limited response from the managers until our last day there, where they jackhammered the side of the house for 2+ hours. Also, unrelated to the house but certainly related to the glowing description the owners give this town: February has a county fair in town, and an MC/music BLASTED up the hill to the house every night until ~1am. Earplugs and white noise still didn't fully cut the noise. Finally, generally, read other reviews of Sayulita before traveling there, particularly regarding the unignorable trend of sickness clobbering the town. It must be the sewage and overpopulation of the area - whatever it is, our entire party got sick, as did the entire house next door (we all drank filtered water, were super careful, ate different things, etc). Having traveled to Mex, Bali, and several other 3rd world areas without any issues in my life, I'll unfortunately be advising everyone who will listen to stay away from Sayulita until they address this pervasive sewage/sicness outbreak in the town. Charming home in beautiful Sayulita!! We had a wonderful stay at Casa Carino. We had everything we needed- cold AC, dipping pool, hammock, kitchen, and plenty of space! Dennis and Ernesto were fantastic to us. Ernesto arranged anything we needed; transportation to and from airport, golf cart rental, and a stop at a beautiful marketplace. We are definitely going back to Sayultia!! We had a wonderful experience at this home. It was beautiful with well appointed bedrooms, a lovely great room, two terraces, and a private pool - all with daily housekeeping and a groundskeeper. We were a short walk to town down a lovely path and enjoyed walking to the beach daily and then returning in the evenings for sunsets, dinners, and drinks. Our children (2 & 5) also loved the stay. The pool was very warm and they had space to explore. Thank you for a memorable vacation - we'll be back! We spent a week here mid February. The house is quite lovely with fantastic art, comfortable beds and a a nice heated pool that is essential in February. Service was great and Ernesto helped us with several arrangements that were cheaper and top notch! The patios were very comfortable for the 4 of us. Also the house is on the side of town that gets shade in the late afternoon which was great in the heat of the day. A couple of cons - there is no oven. A gourmet kitchen should include an oven. Also it was lacking in cookware. One 8 inch fry pan was insufficient for the 4 of us. If you had a larger group than 4 cooking would be too problematic as everything seems to be sized for 2. Not to worry I bought a set of larger fry pans so if they keep them in the house future guests can at least fry more than 2 eggs at a time. Noise does seem to drift directly up from the couple of loud bars that are just down the hill. It did not bother us but if you require silence it might. Sayulita is a great beach town and we would definitely stay here again. Thank you for your review. So glad you loved our house. I am sorry there was only one frying pan for your use. The last group that stayed there also stayed in our house next door and must have taken some of the cookware to that house. Did you ask Ernesto about that? We were down there last month and there was plenty of cookware for 6 of us for many meals. By the way, a group of us are working with the local authorities to curtail the loud bar music and expect positive results this coming week. Thanks again for staying with us. We hope to be able to serve you again at one of our Dreamer Circle Properties in Sayulita. Perfect for our small family~lovely staff~ideal location! My husband and I spent the week of New Years at Casa Carino with our 7 and 9 year old kids. It was the perfect home for us. The house is exactly how it is portrayed in the pictures. Just lovely! Kathleen and Dennis were so easy to work with from beginning to end. The location of the house was ideal. We utilized the path from the cul-de-sac to town/beach everyday. My kids weren't bothered by the incline at all. We rarely used the golf cart we rented as we were already so close to things. The pool was a great break from the beach. Daniel, the pool man and landscaper, was so nice! He even opened coconuts for the kids one day. Katia, the housekeeper, was so kind and went above and beyond to run to town and get some things for us. Ernesto was great too! He helped us out big time when our luggage didn't arrive by coordinating with the delivery service so we could go about our day. The 3rd floor terrace has a stunning view of the beach and town. We would definitely stay here again or have a larger group and rent one of the other homes they own. For those of you with young kids, the bedrooms on the second floor only have external entrances, which I thought would make me feel uneasy. But it turned out that it wasn't a big deal from a mother's perspective. I was anticipating noise coming from town as we were there during one of the busiest weeks of the year. It would have been an issue a few of the nights had we not used a white noise app. Most of the week we slept well with just the sound from the air conditioner. Highly recommend this home for 2 couples or a small family!! For much of the high season, (November through April) and holiday weeks, we book 7 nights from Saturday to Saturday, and nightly rates are less than indicated on the calendar when the booking is for a week. Regarding the number of nights, however, please let us know when you are looking for fewer than 7 nights as we can sometimes make exceptions. If you have questions or if your needs fall outside of the options available, please contact us directly. Rates are subject to change until reservation is paid. Reservation is not confirmed until system accepts payment and confirms dates.